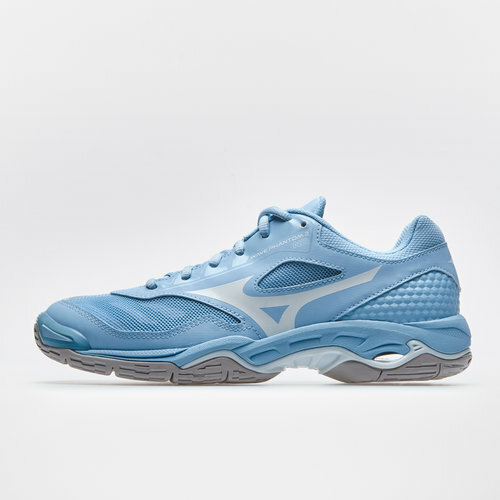 Now that winter is here, check out these Mizuno Wave Phantom 2 Netball Trainers in Cool Blue and White. The Mizuno Wave Phantom 2 is a shoe that says ‘attack’. The air mesh upper and synthetic overlays create a supremely stable, yet breathable zone for your foot, so you can focus on outmanoeuvring your opponents. Inside the trainer, a composite fan-shaped Wave gives lateral support and cushioning at the midfoot, and a moulded sock-liner provides a snug, secure fit. Our FREE ID service lets you add a personal touch to your new trainers. Choose any text or numbers you like including a name, nickname, name of a hero, shirt number or birth year for us to print. We also offer the option of a national flag too. We need up to 2 working days to personalise your trainers for you – so they’ll take longer than usual to be delivered. However, once personalised, we dispatch personalised trainers as soon as possible through our usual delivery services. As customised trainers have been created just for you, unfortunately we are unable to offer any refunds or exchanges for personalised products. Note: Prints may begin to fade with regular use of the trainers. Please allow up to 4-6 working days for dispatch on all personalised trainers.